- Paul and Father Barry visit Kim in a squat; she's adamant that she's never going home. - Shane and Daph kiss. Danny tells Shane what really happened at the shop. - Gordon Miller surveys the bank. Des and Daph are eating breakfast, talking about life in general and work, in particular. The scene is stolen by Daph's pink T-shirt, surely a precursor of the great "cool cat" jumper. The other point of note is how protective Des is of Daph. She tells him not to worry about her stripping. They then discuss the mystical prospect of what they'd do with a million bucks. [More tangible for Mr. Miller, perhaps!] Daph then asks if she can transfer her account to Des' bank. The atmosphere is tense at The Ramsay House, where breakfast is taken in silence. Maria answers the phone, at which point Max challenges Danny about 'the bloody wailing' which kept him awake all night. Danny snaps that he can't help having dreams. It was a client on the phone: Max has to go to work; Shane will have to get himself to training. Max and Maria squabble over the boys' secrecy. Typically, Max is adamant that Danny is to blame. Maria, half-jokingly, hopes that Max never sits on a jury for Danny: he'd have Danny found guilty before he'd even entered the courtroom. Danny is in his room, where Shane interrogates him about the nightmares. Danny defensively says that they are just dreams. Outside, Julie joins the Ramsay boys. She's grateful for the lift to work, but she isn't happy about having to sit next to Danny! 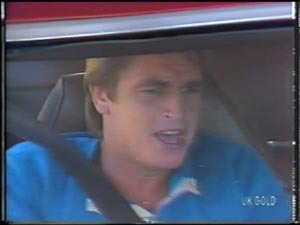 The prospective bank robber answers his phone groggily and tells the caller to come over. Trouble is brewing. No doubt Julie will be in the firing line! Shane, Danny and Julie are in the car. It isn't long before an argument starts. Danny asks Julie if Scott will be coming back to school. She doesn't know but scolds Danny for his part in the tape prank and avers that if Scott doesn't want to go back to school to face 'stupid kids' she doesn't blame him. Shane wryly observes that it's going to be a lovely day. The bank-robber deliberately loads a gun, as he stares at his refection in the mirror. The lads drop Julie off at the bank. Shane tells Danny that they used to call Julie "bossy-boots" at school. Danny finds the nickname hilariously funny. The bank-robber is still preparing himself, putting on his suit. Shane is practising his diving technique at the pool. He isn't in form and Max is disernibly unimpressed. Max's mood worsens when Danny arrives to spectate during his lunch-break. Marilyn answers the phone and tells Julie that the call is for Des. A shrew-like Julie tells her friend that Des is busy. Moreover, he's "Mr. Clarke" at work! 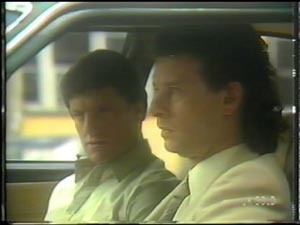 Two men are sitting outside the bank in a car. One is our besuited friend. He heads out with a briefcase and goes inside. Julie serves a customer, and then calls the next. 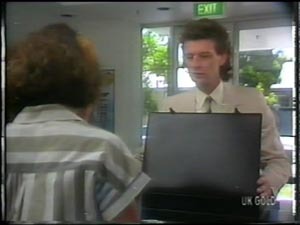 The man walks up and puts his briefcase on the counter. Julie watches him with a mixture of suspicion and intrigue. Shane continues to dive. Max is more impressed this time. 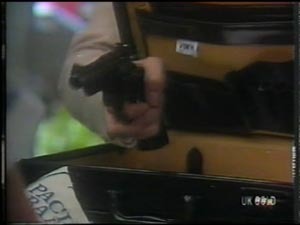 The robber suddenly spins his case round and points a gun at Julie. He camly tells her to do what it says on the note and all will be fine. Julie does as he says, but she's clearly chastened. Marilyn looks over nervously. Julie frantically puts money into a bag. Shane gets out of the pool, as Max says that he's got to get back to work. Julie is still putting money into the bag. Before she hands it over, she pushes the alarm button with her knee. The robber grabs the bag and runs to the getaway car. The villains drive off, relatively slowly given the circumstances. Danny is pestering Shane to drive him to the beach; he says that one afternoon off school won't hurt. As the getaway car drives off, the villains toast their success. Shane has clearly relented, as he and Danny are heading to the beach. Nonetheless, he's still worried about Max's reaction, should dad find out. Danny tells him to stop trying to appease "Mad Max" all the time. 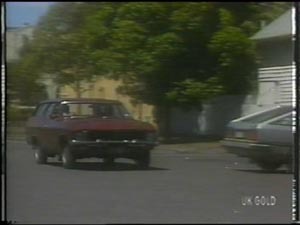 A police car receives word of the bank robbery, at which point the getaway car drives past them and they follow. The villains realise they are being trailed and a chase ensues. Meanwhile the Ramsay boys are in better spirits, as they drive in the opposite direction. 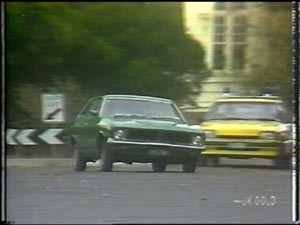 The getaway car swerves erratically; Shane is unable to avoid a collision as the villains' comes hurtling towards him. The villains' car is overturned. 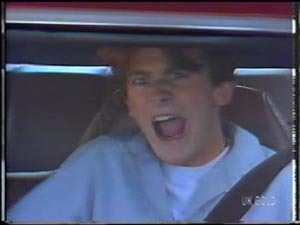 More crucially, there's an arm hanging out of the door of Shane's car, whilst Danny's body is covered with a blanket. Danny regains consciousness, but whilst the policeman tells him not to worry, his only concern is his big brother. 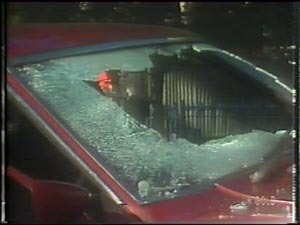 The robber is trapped under his car. By perverse logic, he blames the police for the crash: if they hadn't given chase none of this would have happened. Helen is painting as a shaken, but still prim, Julie comes home. Initially Helen wonders why her grand-daughter isn't at work, but her mood turns to one of concern as Julie relays the day's events. She's particularly worried that Julie fainted and she's anxious to call a doctor. Julie shuns the offer, however, and sits down to read a letter which has arrived from Grandma Robinson. Maria answers the door to a police officer who tells her that there's been an accident. Understandably she's shocked and fears that it's Max, but the officer says that the names he has are Shane and Daniel. The officer asks if she's got a neighbour with whom she can go to the hospital, but Maria is too shaken to think clearly. Her actions are confused as she wanders off to phone Max. Julie is sitting in the front room when Scott comes home. He is immediately subjected to a lecture from his older sister who tells him to go back to school. He's more concerned with Bess' letter and indeed Helen's whereabouts. He's shocked to hear that there's been an accident. It's worth noting that Julie refrains from telling Scott about his best mate's accident for a considerable period of time! Helen is on the phone, leaving a message for Max. She then goes to comfort Maria, who, despite making little sense, explains that Danny is out of theatre: He's broken a few ribs, but he'll be fine. The chief concern is Shane, however. Maria laments that Danny should have been at school. Dr. Lockhead (Stephanie Danile aka Ruth Wilson and Chloe Lambert) visits Danny. He immediately asks about Shane, but there's no news. The doctor tries to calm him, saying that he'll be the first to know should there be any progress. Danny bewails that he should be in Shane's shoes. His thoughts swiftly turn to Max's reaction. Despite being informed that his dad has arrived, Danny is adamant that he won't see him. Dr. Lockhead goes to meet Max and Maria. She explains that Danny will be fine, but regrettably informs that Shane is fighting for his life. Ever irascible, Max becomes increasingly angry and searches for a scapegoat. He avers that it must be Danny's fault. It always is! His mood looks set to worsen, but Helen's presence tempers his wrath. Maria informs Max how supportive Helen has been. The very pretty Nurse Stevens (Gloria Ajenstat, aka as Susan Cole) is trying to cheer up Danny. She wants him to see his father. He steadfastly refuses: mum yes, dad no. Out in the waiting room, Max, Maria and Helen anxiously await news of Shane. The specialist comes out: Shane is going to be all right...but there's damage to his spinal cord.